I just finished reading Owen Lee's Ultimate Language Secrets. Wow, what a great language learning system! I was skeptical when I first started reading--in the first few pages, he promises that you can learn multiple languages at the same time and that once you digest and internalize his ideas, it will be easy. I continued reading with a "We'll see about that," attitude. I was thinking to myself, "Show me what you've got and I'll tell you if it is easy." Very quickly, I was drawn in by his language learning system. His writing style combines serious, useful information, with an engaging, lighthearted tone. He knows what he's talking about when it comes to language learning systems, but doesn't take himself too seriously. I was hooked. The material is easy reading and very engaging. 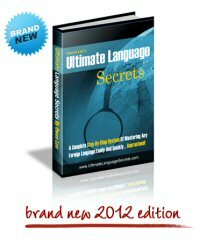 Ultimate Language Secrets contains 181 pages of creative, useful language learning solutions. Note: this is an ebook, you'll get access to it in an email that arrives moments after you check out. In addition, he gives you four "freebees;" keep reading for a review of those addendums to his language learning system at the end. Owen Lee is a polyglot who speaks Shanghainese, Mandarin, English, German, Dutch and Spanish, so he definitely has expertise on language learning tools. He begins with a discussion of goals. I'm on board with that idea, definitely the first step that we recommend when learning a language. Owen gives you additional suggestions about how to set "stretch goals" that require you to reach a little. He explains MUSTS saying that no matter what happens we always get our "musts" done. When language learning becomes a MUST-do task, then we find success. He shows you how to make it a "must." Owen proposes using the environment as your language learning tool, including useful ideas about how to bring the language learning world to you even if you don't live in the country where it is spoken. Now, that is useful! That is exactly what we promote at Walkabout Language Learning; Owen's language learning system builds on what we believe by offering additional language learning tools. You can pick and choose from his list of language learning solutions, and implement the ideas that work best for you. Owen gives you a list of 600 essential vocabulary words. He explains that by mastering this list in your target language, you'll have the building blocks to connect when you learn grammar. That is a unique approach--so many language books dive into grammar first. When he talks about grammar, he shares a trick to make learning grammar a snap. Armed with this essential vocabulary list, you'll start out right as you begin your language study. His advice will to help you maintain your study. He says: "Truth is, it is better to learn for 5 minutes every day than to learn for 5 hours once a week." You'll find language learning tool useful to leverage those busy days when you have hardly a spare moment--five minutes as you wait in line at the store or the bus stop is all you need to maintain your progress. He even gives you ideas about how to squeeze language learning into a full schedule. He teaches you to improve your memory. Since language learning involves a significant amount of memory, Owen gives you practical tools to memorize easier and faster. All of the language learning solutions that I've seen are silent on the topic of memory. This language learning tool will turbo boost your study power. Ultimate Language Secrets is a language learning system that is packed with useful, practical, creative ideas to guide, direct and supplement your language study. He gives you a wide range of language learning tools, delving into areas where other language learning systems are silent. For example, he gives you a list of discussion topics to use to start and maintain conversations. (His book can make you a good conversationalist even in your own language.) You'll be pleased by the breadth of language learning techniques that he explains. His language learning solutions will complement your current study at a foreign language course or can be used to direct your own program. You decide. Beyond Languages: 28 pages: This is a fabulous guide to culture and MORE. It includes explanations about culture, history, people, sports and everything that makes different groups of language speakers who they are. Fantastic resource! Exploring Language Families: 37 pages of linguistic material about language families. This is a layman's guide to linguistics. It is somewhat dry, but definitely a nice summary of language families. Language Inspection: 17 pages. A thumbnail description of the major world languages. Includes a chart with rankings of popularity, ease of learning, number of speakers, gross domestic product, and a mini blurb. Also a more detailed paragraph description of each. Interesting reading for those who are curious about other languages. Basic Foreign Phrases: 18 pages: I found this the least useful part of all of his language learning system. It includes lists of about twenty basic phrases in (not exactly the same phrases in each language) Dutch, French German, Italian, Portuguese, Russian, Spanish, and Swedish. With internet resources available, you can easily find this information elsewhere. If you have any foundation in your target language (you probably do) you know all these phrases. I enjoyed reading Ultimate Language Secrets. It is an interesting, easy-to-read, and useful language learning system. If you buy one language learning book this year, make it this one. It was definitely money well spent for me. Read this page to learn 10 foreign language learning tools that will accelerate your language learning solution.